“If it were just this alone, you would say yes. On the merits it's not a bad idea, there was over-sentencing in the past ... But we know what he's done with immigration reform." "Legislation comes from Congress, it doesn't come from the White House." Wow. That's analysis! Do they actually pay people for that? True, the Alien Sedition Laws and Prohibition laws came from Congress. What Lincoln was thinking when he issued the Emancipation Proclamation (without consulting Congress), we don't know! And the point is ??? "Why can't the president obey the Constitution ..."
What? Does he mean the document that explicitly gives the President the power to pardon, and with little or no restraint? Does Krauthammer mean the document with an attached Bill of Rights that bars "cruel and unusual punishment" - like excessive / unfair sentences? No kidding? We fought a Revolution so Congress could be the new Monarch? What world is this guy living in? Why does the Constitution explicitly give the President the power to veto legislation from Congress? Why does the Constitution explicitly give the President the power to pardon people who violate laws written by Congress? What is this whole stupid separation of powers and checks and balances thing for anyway? 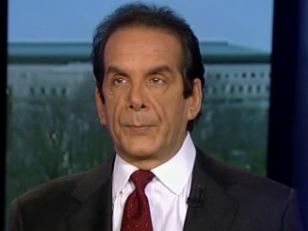 Simple: To protect us from ideological boneheads like Charles Krauthammer!